Heat oven to 350°F (325°F for dark or nonstick pans). Spray bottoms and sides of 2 (9-inch) round cake pans with cooking spray. In large bowl, beat Cake ingredients with electric mixer on medium speed 2 minutes, scraping bowl occasionally. Divide evenly between pans. In large bowl, beat marshmallow creme, softened butter, vanilla and 1 tablespoon of the milk with electric mixer on medium speed until blended. Beat in powdered sugar until fluffy. If necessary, beat in more milk, a few drops at a time, until spreading consistency. Place one cake layer on serving plate. Spread 3/4 cup frosting on top; top with second cake layer. Frost top with thin layer of frosting; spread remaining frosting around side. Press coconut up side of cake. Refrigerate while preparing chocolate ganache. Meanwhile, in small microwavable bowl, microwave chocolate chips and whipping cream uncovered on High 30 to 50 seconds; stir. Continue to microwave in 10-second increments until chips can be stirred smooth. Let stand at room temperature 20 to 25 minutes, stirring occasionally, until slightly thickened and still pourable. Pour chocolate mixture over top of cake to cover, letting some drip down side. Return cake to refrigerator about 30 minutes or until chocolate sets up. If refrigerating cake longer than 30 minutes, let cake stand 15 minutes before cutting. Store loosely covered in refrigerator. Coconut can be purchased either sweetened or unsweetened, large flaked or finely shredded. In this recipe, we used large flaked, unsweetened coconut for the side of the cake. The easiest way to toast coconut actually is in the oven. Heat oven to 350°F. Bake coconut uncovered in ungreased shallow pan 5 to 7 minutes, stirring occasionally, until golden brown. Keep a close eye on coconut while toasting, because it can quickly turn from golden brown to burnt! To keep your serving plate clean while frosting and topping the cake, place strips of waxed paper around edge of plate. Remove when chocolate is set and before serving. The inspiration for this recipe came from coconut macaroons. These snowball-shaped confections are made of shredded coconut held together with egg whites and sugar and dipped in a chocolate ganache. Marshmallow buttercream is a fabulous twist on our classic vanilla buttercream recipe. It’s easy to whip up in 10 minutes using a jar of marshmallow crème. Decorating cakes takes patience, which for this cake means not rushing the cooling time. It’s important to wait until your cake has cooled completely, so the frosting does not start to melt when applied. If the cake is still warm, it will start to peel off as you frost, resulting in crumbs in the frosting. After frosting, chill the cake for a short time to allow the frosting to set. 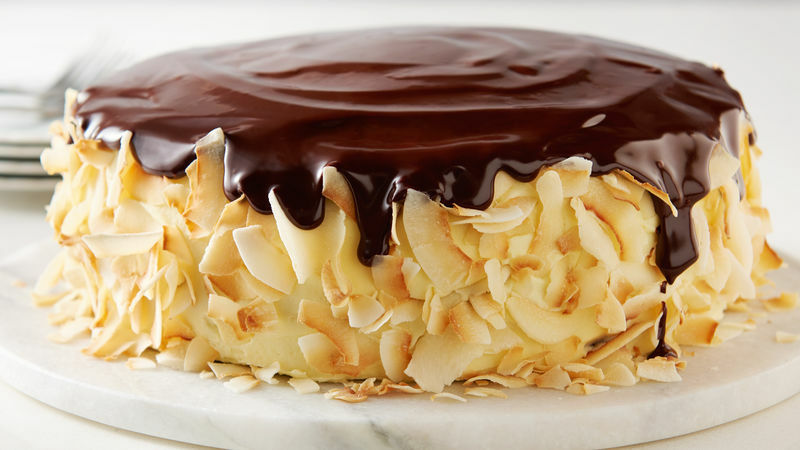 Once your frosting has set, you can make your ganache. The ganache should be cool enough that it won’t melt the buttercream, but it should be warm enough that it flows easily, covers the top and cascades down the sides. After making your ganache, it’s recommended you let it stand for a few minutes and stir occasionally until it cools to the right consistency. When you think it’s ready to pour, test it by letting one spoonful of ganache drip down the side of the cake. If it seems to flow well, it’s ready. If it flows too quickly, let the ganache stand a couple more minutes. When it’s ready to pour, transfer ganache to a glass measuring cup, which will give you more control. Begin by pouring a good amount of the ganache onto the center of the cake, and wait for it to spread across the top. Then, pour the ganache, a little bit at a time, around the edge of the cake. Tap the cake plate gently against the counter to help the ganache flow across the top and drip down the sides. Add more ganache in spots, as needed. Finally, use a long icing spatula to smooth out the top. Try to do this in as few strokes as possible, ideally one or two, as the more you play with the top, the more lines and unsmooth surfaces you create—less is more here! And remember, one of the best things about this cake—besides the fact that it’s delicious—is that there is no wrong way to create your drips. This cake will look beautiful, no matter what.